This entry was posted in Health & safety solutions on 2017/10/18 by Susan. It’s essential to identify potential hazards when harvesting timber near power lines. Start during the planning stage, to keep workers safe. Forest companies and harvesting contractors should contact BC Hydro at the planning stage of any logging project near power lines. I read about this in a recent monthly safety alert from the BC Forest Safety Council (BCFSC). Companies need to answer two key questions: Is harvest feasible in the area closest to the line? And, if it is feasible, then how do they manage risks to workers? “If there’s timber that poses a potential hazard – trees that could fall or come into contact with the power line – then companies need to speak with BC Hydro about the procedures for managing that timber,” says Dustin Meierhofer, BCFSC Director of Transportation and Northern Safety. 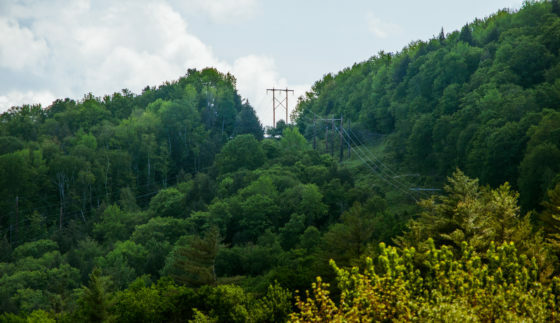 The hazard includes not just trees that could contact the power line directly, but also tops or branches that could fall within what’s known as “the limits of approach” to the power line. Typically, that’s a circle of at least 10 feet around a 25 kV line and a larger circle for higher voltages. Different situations call for different solutions. In some cases, the safest option may be not logging the area but instead preserving it as a wildlife tree patch, for example. If harvesting is feasible and the timber is within limits of approach to the power line, a certified utility arborist will be required to supervise falling activities or physically fall or top trees in it. BC Hydro would like people to use the Logging Near Powerlines Emergency Contact Form. Filling it out helps ensure that companies and contractors fulfill their responsibilities with regard to the Occupational Health and Safety Regulation, which you can read more about in BCFSC’s “Alert of the Month” for August 2017, Are you logging near powerlines? What happens when power is interrupted? BC Hydro uses a mechanism for keeping power maintained throughout the grid. If something interrupts the power in the line – such as when a tree falls on it – the mechanism is auto-set to restart it. This means no one should touch the downed line or attempt to continue work in the immediate vicinity. In their early talks with BC Hydro, companies may be able to arrange a no reclose option/agreement, which would stop the power from restarting automatically. But every situation is different. That’s why talking early is important. Thanks to Dustin for talking with me about this. Very insightful and thoughtful,because it create a serious awareness on the detail housekeeping,..plan of using it for next safety meeting.